Dat titanium. 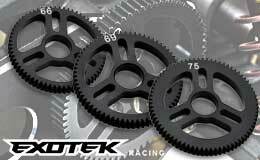 Exotek adds to their 'Flite' range with some precision machined titanium front axles for the Team Losi 22T and 22T 2.0 1/10 trucks. Valid for attaching the battery to the Sakura Zero carbon chassis. Extra stiffness as compare to stock!! Perfect fit. Looks fabulous. I highly recommend it. For this price is the best you can get. I would prefer with normal mounting holes, but it is just fine. It does not include the small 3mm worm screw. Nice item thanks heaps guy. Works great. Better than stock nut. Exotek Racing uses research and development backed by 20 years of R/C car experience to test and evaluate every single part they create. 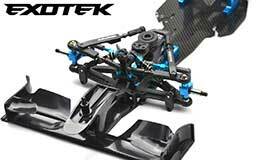 They make aftermarket upgrades for popular brands such as Team Associated, Durango, Kyosho, HPI/Hot Bodies, Losi, Serpent, Tamiya, Traxxas...and more! They're not the first to market their products, but you can bet on their quality because the parts have been tested prototypes after prototypes, until the part fits perfectly. Check out Exotek and you won't disappoint. Everything available at the largest online RC store.